S69, Indonesia, Java? Unknown issuing authority, Cob 8 reales, ND, Silver (27.63g) Nice and Interesting! S69, Indonesia, Java? 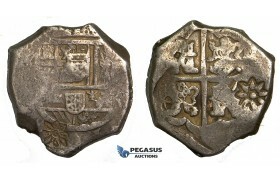 Unknown issuing authority, Cob 8 reales, ND (late 17th - early 18th c.? ), coun..